My name is Mellow, but I am best known as Meyo, or Mayo. I was born on April 29, 1996 in the midwest. I was adopted by my human pet on June 17, 1996. In the picture above, I am about one years old. 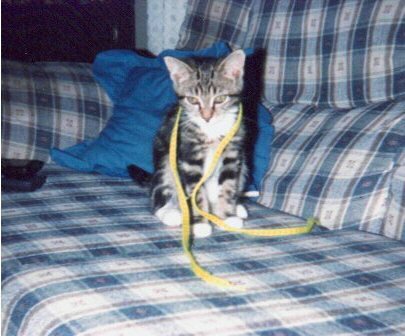 I had just woken up when my pet human draped a shoe string across my neck, and took a picture of me. I am a loving kitty. I love to play and cuddle with my pet human. My other hobbies are catching bugs, and sleeping. I also love to sit on any work my pet human is working on. I am a little timid towards other people that come to my palace, them having unfamiliar scents. I wake one of my human pets up early in the morning, so they can give me my can food. I eat dry food all day long though. I get to roam my palace during the day while all of my human pets are at work or school. I hate weekends. The pets stay at my palace all day long, and they never leave me alone so that I can sleep. I have some great stories that my pet human wrote about me, that you can find in my profile. You can also see some pictures of me in Mellow's Memories.